April 7, 2017 – Based on an economic model developed by the Performing Arts Tax Working Group, the costs of compliance to non-resident taxation largely outweigh the potential tax revenues for the Canadian government. By as much as 10 to 1! 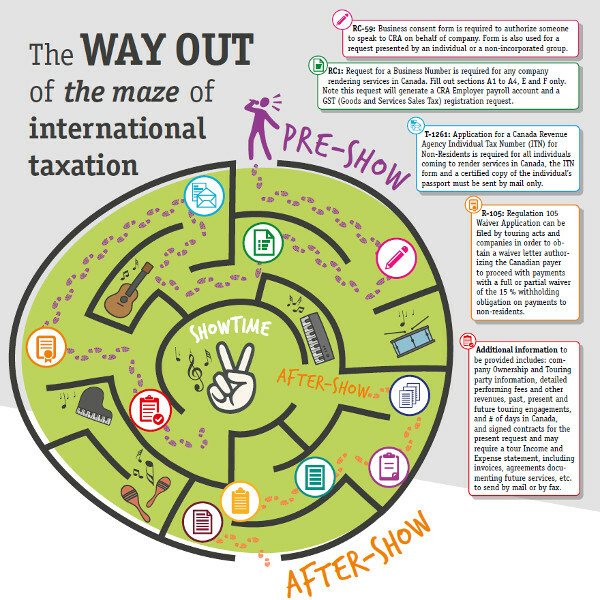 The Performing Arts Tax Working Group, with support from Regroupement des événements majeurs internationaux and Festivals and Major Events, is currently developing an infographic illustrating the endless steps of non-resident taxation. This economic model is built using available statistics and sample, representative cases of actual tours by foreign artists. It provides estimates of fees paid by Canadian presenters to foreign artists, of potential taxation revenue, and of the costs of compliance to all obligations related to non-resident taxation. Based on this model, the costs of compliance in the non-profit presenting sector – performing arts centres and festivals – are at least 10 times greater than the fiscal revenues. In the commercial sector – arenas – costs of compliance are roughly equivalent to the fiscal revenues. All in all, we estimate that non-resident taxation in the performing arts generates four times more red tape costs than it raises tax revenues. The model does not take into account the administrative costs incurred by the Canada Revenue Agency; only those incurred by the Canadian payer and the non-resident artist. The Performing Arts Tax Working group has been meeting key politicians to raise awareness of this issue. In the last two weeks alone, meetings were held with Standing Committee on Finance member, Francesco Sorbara, with Senator René Cormier and with Parliamentary Secretary to the Minister of Canadian Heritage, Sean Casey. The response has so far been very positive. More meetings are expected soon. If you wish to meet your own MP to talk about non-resident taxation, download our meeting package or contact us for advice and support.